This section provides advice on some of the key factors that will help you to deliver a successful innovation project. Studies in the private and public sectors have shown that there are key enablers to innovation. But until recently, there had been little to indicate whether these factors translate into humanitarian innovation and/or whether there are other factors required in the humanitarian sector. This section builds on a set of key success factors for innovation in humanitarian contexts derived from the synthesised findings of 15 case studies from the HIF’s portfolio, undertaken in partnership with ALNAP (Obrecht and Warner, 2016), some of which are shared with the public and/or private sector, and some of which are especially relevant to the humanitarian sector. We are using another of the key success factors from that report as the framework for this guide – an innovation process. We outline what the key enabling factors are and why they are important, and we provide you with insights into managing these different aspects of innovation practice. Based on research for the Guide, we have made two key changes to highlight the importance of both strategy and team management in managing an innovation process (see, for example, Bessant and Tidd, 2013, and Goffin and Mitchell, 2005). We cover the following factors; the more of these you have in place, the more likely you are to develop an innovation that has a positive impact for its users and crisis-affected communities. You may not be in control of all of these factors, but by knowing what should be in place, you can advocate, lobby and influence, and provide guidance on how to develop these enabling factors. It won’t just be your innovation that benefits, many of the tools and insights could benefit your whole organisation. It is worth assessing each of these factors in turn, and then mapping them out so you have an understanding of the factors that you will need to try and influence and work on in your organisation to improve. It will also help you understand where your organisation is strong so that you can make sure you leverage these strengths for the benefit of your innovation. This can be done using an enabling factor audit. Download the template and, in discussion with your colleagues, rank each of the factors according to how necessary you think they are to have in place, from 1 (not at all important) to 5 (very important). 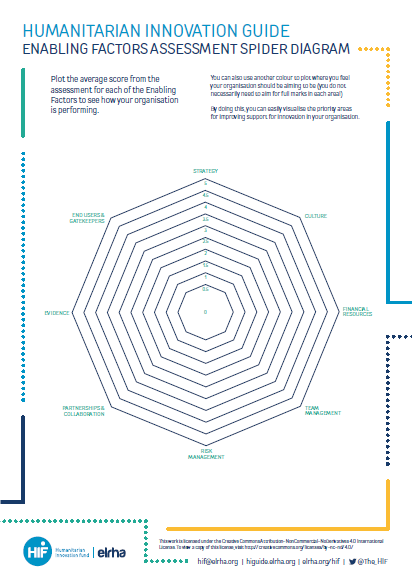 Next, rank your organisation’s performance on each factor using the questionnaire. Finally, use two different colours to draw “webs” around the chart, allowing you to easily visualise gaps across each dimension! You will then be able to identify the gap between where you are now as an organisation and where you need to be. This next section will provide some background and useful tips for helping you on this improvement journey.